Go up to 75mbps today! We're migrating all of our legacy DSL customers to a faster, fiber-based broadband service. We can now offer speeds up to 75mbps for business and residential customers in 23 states. Click LINK TO PROMO INFO for details and call/email us to get started! New Help tool available for remote support! 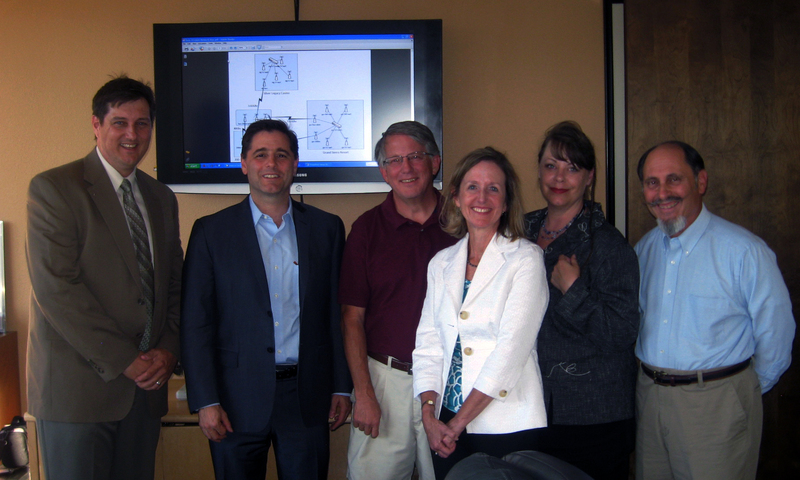 Federal Communications Commission Chairman Julius Genachowski met with executives from Great Basin Internet Services (GBIS) and the Wireless ISP Association (WISPA) on Monday, July 30th at the former’s offices on Ridge Street. The purpose of the meeting was to discuss issues affecting Wireless Internet Service Providers, ISP's in general and their concerns for the Internet going forward. The Chairman was in the Northern Nevada and Eastern Calif area reviewing Internet services in areas that included Reno and Markleeville. Mr. Genachowski, accompanied by Carol Mattey, the FCC Deputy Chief of the Wireline Competition Bureau, met with GBIS owner Barry Sherwood, GBIS founder Bruce Robertson, WISPA board member Jack Unger and other GBIS staff. Initially, they discussed the history, services and coverage area of GBIS in the Northern Nevada area. The Chairman toured the data center and some of the GBIS wireless access points in order to better understand the workings and challenges facing small WISP's in the areas of technology and customer service requirements. They also discussed both the history of broadband services in this area and thoughts on where broadband coverage and service may be heading in the future. Central to the discussions were ways for smaller telcom providers to have better lines of communication with the FCC. The possibility exists of setting up a liaison within the FCC that has the responsibility of being a single point of contact to help deal with the questions and issues of this industry. We've recently discovered that 411/Information and some printed phone books are giving out incorrect addresses and phone numbers for us. We are trying to get this corrected. In the meantime, our contact number is the same as it's always been: 775-348-7299. Please do feel free to call or email support@greatbasin.net with any questions or concerns.